You might just say that this is our forte! The construction of our world-class arena (Credit Union Place), 6-sheet curling rink and outdoor sportsplex, and our astounding volunteer experience has made Dauphin a forerunner in hosting events on a regional, provincial, and national scale. In addition to streamlined organization, flexibility, and a team approach, financial success is the common thread of the legacy of these events. Thanks to the success of the 2010 RBC Cup alone, Destination! 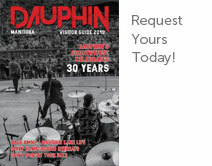 Dauphin has established an Event Hosting Fund that was set up to support future major event acquisition, organization, or operation.